1. A scorching critique of the Fed's unconventional policies--by the president of the Philadelphia Fed. If you don't have time for the whole thing, read John Cochrane's excerpts and commentary. 2. À propos of unconventional monetary policy: how loose are monetary conditions anyway? Back in the day when "straightforward" tools were in place, the Fed funds rate was all you needed to know. These days we don't observe the "true" policy rate, because once the Fed hit the zero bound, they replaced the Fed funds rate with QE as the tool to loosen monetary conditions. The true Fed funds rate has gone underground, so we can't see it. 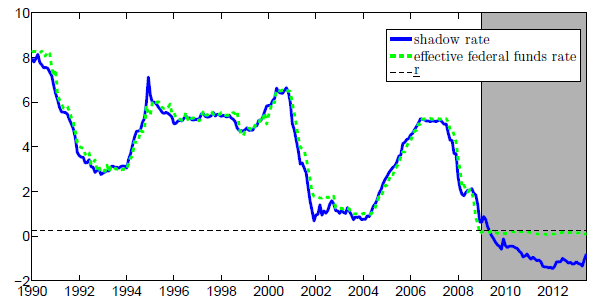 Dora Xia and Cynthia Wu have developed an estimate of the shadow policy rate. (Hat tip to Jim Hamilton.) The authors were kind enough to make the data available online. 3. House prices in the UK: multiple estimates. And: is the UK housing market in a bubble? 4. The Canadian housing bubble.